My car needed an oil change. You might be thinking, What does that have to do with walking? Well, when weather permits, I drop off my car at the shop in the early morning using the key drop, and I walk the 4 miles back home. Not all walks are as scenic as the one I took last week, granted. But that’s part of the appeal of walking — taking in the scenery, no matter what it might be. Headed southbound on Route 206 in Hillsborough Township, NJ. And a note about walking safety: Whenever possible, one should walk against traffic. That enables you to see what’s coming at you and react more quickly if necessary. 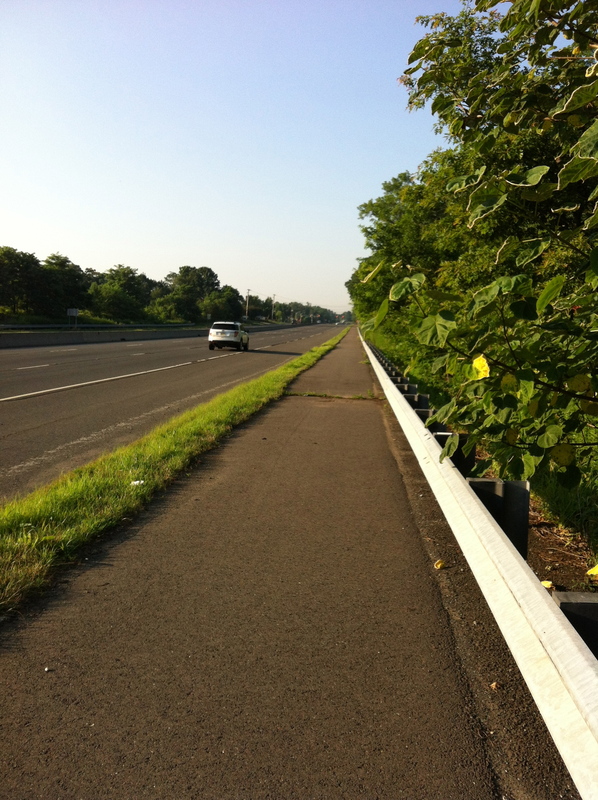 On my walk today, I was walking with traffic — but based on the very wide shoulder and the sidewalk/walking path, there was enough of a buffer. This entry was posted in Where I've walked and tagged safety, walking by Walk With Joelle. Bookmark the permalink. Your observation about walking against traffic is spot on! While walking in a race in South Carolina a few years back, the course ran parallel to a lane of traffic. Walkers were walking the same direction as traffic. A friend in a passing car recognized me and gave a “hey there!” Toot of the horn and I almost had a heart attack. I did not see her. I am nuts about making certain I walk facing traffic!